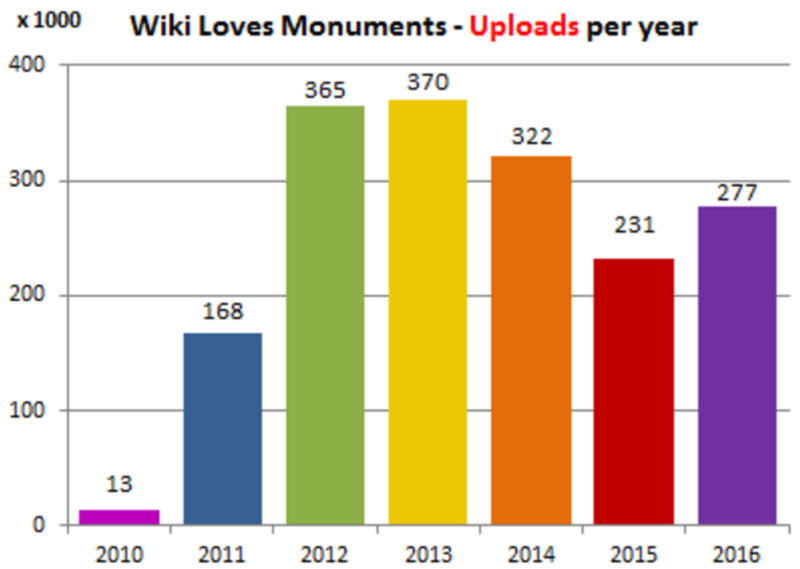 In 2016, Wiki Loves Monuments (WLM) was a top ranking Wikimedia community initiative in terms of attention raised. In this post, we provide further stats on the 2016 contest. All key metrics showed significant growth compared to last year: the number of participating countries (more than 30% increase), the number of participants (62% increase), the number of first time contributors to Wikimedia projects (78% increase), and the number of photos uploaded (20% increase). This year, we also welcomed eight first time participating countries from very different parts of the world (100% increase). In 2016, 42 national competitions participated in WLM contest, 9 more than in 2015, the 2016 contest ranks second after 2013 when 51 national competitions participated. (See first table). 8 countries participated for the first time (Bangladesh, Georgia, Greece, Malta, Morocco, Nigeria, Peru and South Korea) while 7 countries participated for the 6th time (Belgium, France, Germany, Norway, Russia, Spain, and Sweden). A total of 277,406 (and counting) images were uploaded in 2016 which is 20% more than 2015. 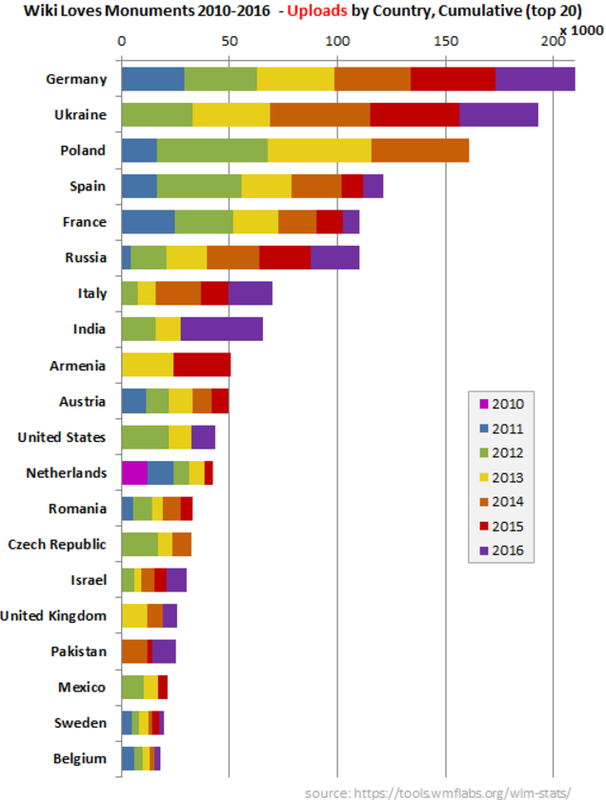 Germany, with almost 14% of the total number of image uploads, was the top country in terms of the number of uploads (38,809 photos were uploaded for Germany’s contest), closely followed by India and Ukraine. 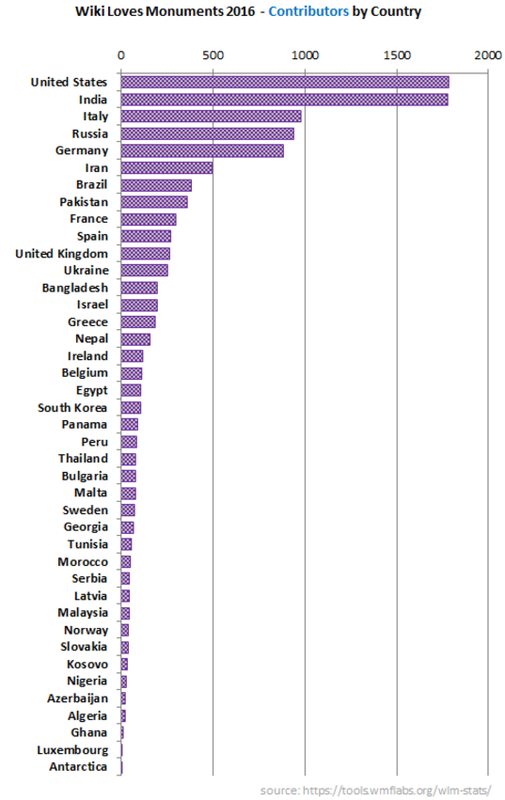 In the following chart you can see the number of uploads by country. 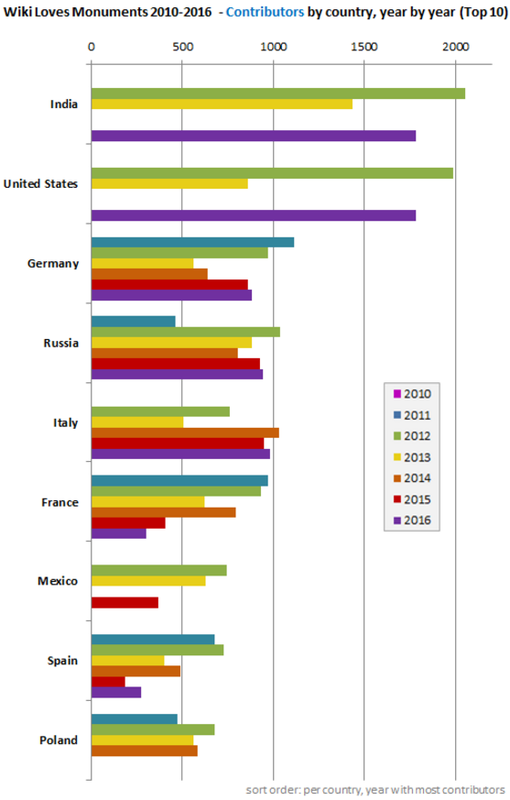 While we are at reporting the 2016 upload counts per country, it is interesting to look at the cumulative number of uploads by country since 2010 when WLM started. See chart below. 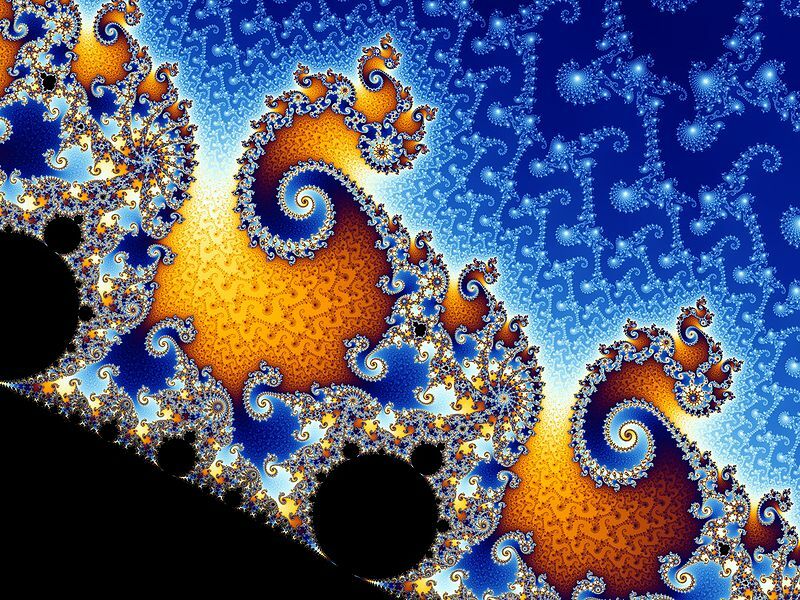 In the context of WLM, contributors are those who upload at least one image to the contest. In 2016 India and United States excelled in number of uploaders: 1784 and 1783 uploaders, respectively. 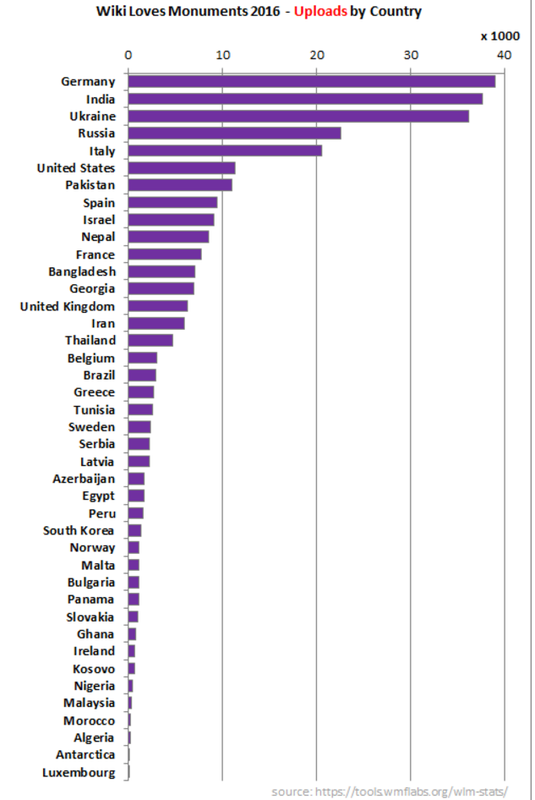 Below you can see the number of contributors by country, and contributors by country, year by year (top 10). Every year the WLM contest brings peak activity on Commons in the month of September. The second peak earlier in the year, mostly since 2014, is the result of the Wiki Loves Earth contest. The plot below shows the overall file upload activity in Commons, under two category of bot uploads and manual uploads. The spike in manual uploads in September is due to Wiki Loves Monuments, and while the bot uploads had been pretty flat in the past 3 years, we observe a spike of bot upload starting September 2016. This post was initially written and posted at http://infodisiac.com/blog/2017/01/wiki-loves-monuments-2016/ by Erik Zachte. The current post is a slight adaptation of that post by Erik for Wiki Loves Monuments Blog.